See shooting stars this weekend! 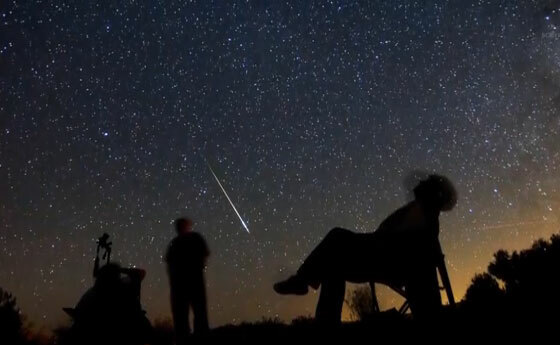 The famous “Perseid meteor shower” peaks this coming weekend! In this article we’ll discuss what a meteor shower is, the mythology behind the “Perseids,” how to view the shooting stars, and when to view them. Author Name A Star Live's AstronomerPosted on August 7, 2017 August 9, 2017 Categories AstronomyTags shooting starsLeave a comment on See shooting stars this weekend! Planets and Shooting Stars Galore! The brighter planets of our solar system put on some impressive night shows in August! You can also see one of the best meteor showers of the year this month. You don’t need a telescope to enjoy these sights, although you’ll need a scope to see the rings of Saturn or the large moons of Jupiter. Enjoy! Over the night of Aug. 11/12, you can see lots of shooting stars (weather permitting) -- perhaps as many as 60-80 per hour! The “Perseid Meteor Shower” is going on right now, with the best viewing opportunity between midnight and dawn over the night of August 11 and 12 (August 12 and 13 for those of you in the eastern hemisphere of Earth). The Perseid shower is one of the best of the year. During the pre-dawn hours you may be able to see as many as 60 to 80 “shooting stars” flying across the night sky. You don’t need a telescope or binoculars — just a nice reclining lawn chair and something to keep you cool — or warm, depending on where you are in the world. Starting about midnight, just lie down, look up, relax and enjoy the show! The Perseids get their name from the constellation Perseus, from which they appear to come from as you view them from your lawn chair. The meteors are each about the size of a grain of sand, but travel at very high speeds — an average of 130,000 mph (209,000 km/h)! Saturn, Mars and Spica in the western sky on the evening of August 7 (August 8 in the eastern hemisphere of Earth). Most of the bright planets of our solar system put on quite a show this month! Shortly after sunset on the evening of August 7 (August 8 for those of you in the eastern hemisphere of Earth), look for a triangle of lights toward the western sky. The triangle will be formed by the planets Saturn and Mars, and by the bright star called “Spica.” (See image at left.) The light you see from Spica took about 261 years to reach us. All three objects are located in the Name A Star Live constellation Virgo. Take another look at these three bright objects over the evenings of August 12, 13 and 14 and you’ll see them form a line in space, with Mars in the middle! For you early birds … Look in the eastern sky during the pre-dawn hours for the planets Venus and Jupiter. Venus will be the brightest object in the eastern sky — the so-called “Morning Star.” The planet begins the month in the Name A Star Live constellation Taurus, then skirts across a small portion of the Name A Star Live constellation Orion, and spends the last half of the month in the Name A Star Live constellation Gemini. Jupiter remains in Taurus throughout the month, near the V-shaped group of stars called “The Hyades.” If you find the Hyades, you’ll notice that its most prominent star appears red in color. That is the star called “Aldebaran.” Jupiter will be the bright point of light near Aldebaran — near the ‘open part’ of the “V”. Venus and Jupiter in the eastern, pre-dawn sky of August 14, as viewed from the northern hemisphere of Earth. Author Name A Star Live's AstronomerPosted on August 2, 2012 Categories AstronomyTags constellation, planets of our solar system, shooting stars, solar systemLeave a comment on Planets and Shooting Stars Galore!